He looks up at me. And then, after a beat, he breaks out smiling. “Hey”, he says, “I’ve been looking all over for you.” I don’t know what to say. I am so happy and so scared. Paul has been gay his whole life and he’s confident about almost everything. He doesn’t have to hide his feelings like best friend Tony. Or even cope with loving the wrong guy like his other best friend Joni. Tony is Paul’s best friend who lives in the next town over. He is gay but unlike Paul, Tony’s parents are religious and are not accepting of his sexuality. It is great to see a strong friendship between two gay teenage males that is not romantic or sexual. Joni is Paul’s other friend, when she starts dating Chuck, a classmate Paul does not approve of, it puts strain on their friendship. The supporting characters are interesting and vivid. There is Infinite Darlene, a drag queen who is the homecoming queen and star quarterback, and Zeke the “Gaystafarian”, who performs gigs at the local bookstore. 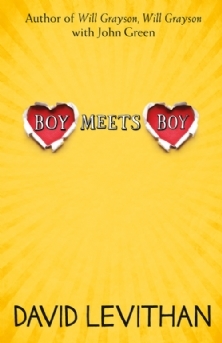 It’s boy meets boy, when Paul is instantly attracted to Noah, the new boy at school, after an earlier chance meeting in a bookstore. Similar to boy meets girl stories inevitably boy loses boy when Paul kisses his ex-boyfriend Kyle, who is questioning his sexuality. Paul has to set out to win Noah back. The school bookie put his odds at 12-1 of Noah taking him back but Paul is determined to gain his trust back. Despite Paul’s mistake he is a likable character. The novel presents an almost perfect utopian world where all sexualities are celebrated and accepted. For example, there are the Joy Scouts instead of the Boy Scouts (after the “Boy Scouts decided gays had no place in their ranks, our Scouts decided the organization had no place in our town”) and the high school has a thriving gay-straight alliance. Levithan is deliberately showing readers a world one would hope will exist in the future where there is no judgment, prejudice or discrimination against LGBTQ people. The writing is very witty, wry and quirky. Although the pace is a little slow moving at times. Ultimately it is a quirky story about love and the obstacles to love.